George Segal, a famous American sculptor responsible for the piece “The Steel Makers” outside of The Museum of Labor and Industry, is considered the artist responsible for introducing the use of plaster bandages as a medium for sculpture. He did not use the plaster as a mold, but instead the shells cast from his models became the sculptures. 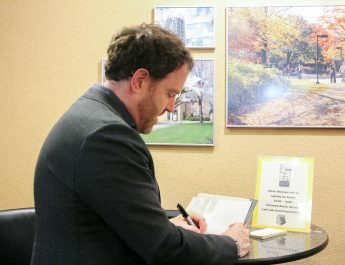 During the late 1970s, Louis Zona, the executive director and chief curator of the Butler Institute of American Art, and one of his classmates decided they wanted to try to get public artwork downtown to assist in revitalizing the area. “We knew we wanted George Segal. That was going straight to the top, which the agency discouraged us from doing because they said he is too important, and that we didn’t have enough money to get him here,” Zona said. They raised money for the project and were awarded the National Endowment for the Arts ­— a grant that Zona feels was very impressive. The National Endowment for the Arts is an independent agency of the United States federal government that offers funding for projects exhibiting artistic excellence. The agency came to Youngstown to meet with them to see what type of project they wanted to do. They received the agencies approval to contact Segal, who was in New Jersey, and he told his agent he wanted to come to Youngstown. Born in New York on Nov. 26, 1924 to a Jewish couple who emigrated from Eastern Europe, his parents settled in the Bronx where they ran a butcher shop. They then later moved to a New Jersey poultry farm where Segal worked. He discovered his love for art while attending Stuyvesant Technical High School in Brooklyn. After World War II he attended Pratt, Cooper Union and New York University where he continued his art education and received a teaching degree in 1949. Segal’s piece “Man Sitting at a Table” marked the discovery of a new sculptural technique and a turning point in the artist’s career. After a student brought a box of dry plaster bandages to class, Segal took them home and experimented with applying them directly to his body. As he was flying to Youngstown to meet with Zona and his classmates, he was thinking about Ohio. Segal said he had never done a sculpture in Ohio and thought about doing a golf piece for Jack Nicholas, who was from the state. “When Segal flew over Youngstown, the steel mills were still functioning. He couldn’t get over the power of the steel industry in the area, and he was so impressed he decided he was going to do this project whether they have enough money or not,” Zona said. They took Segal to Republic Steel where he met Peter Colby Jr. and Wayman Paramore, who had been tending a furnace for 25 years together, and asked them if he could use them as models. 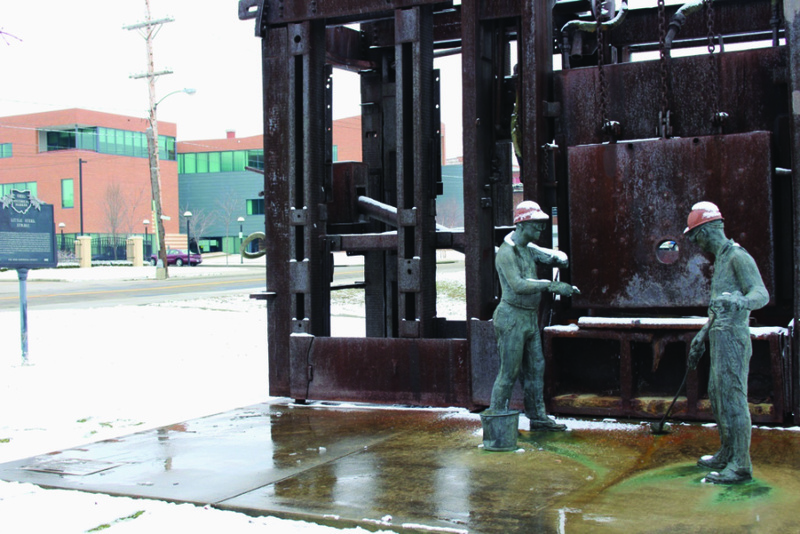 The steel company later donated a furnace and put it together in downtown for the sculpture. “He didn’t want to fake it. He wanted actual steel workers, so we got permission from the dean of the College of Fine Arts to use a room in the basement of Bliss Hall to work on his project, which took six to eight months,” Zona said. The plasters of the two steel workers were later cast into bronze. Segal worked with the sculpture department at Ohio University for the downtown outdoor sculpture. Complications did occur between the sculpture and the community. During Segal’s time working on the project, the steel industry in Youngstown crashed. In 1979 when “The Steel Makers” was being installed, people were outraged. Graffiti was written on the piece on the night before its dedication. In addition to graffiti, one night someone had taken a cable and wrapped it around one of the figures and pulled it out of its anchors. 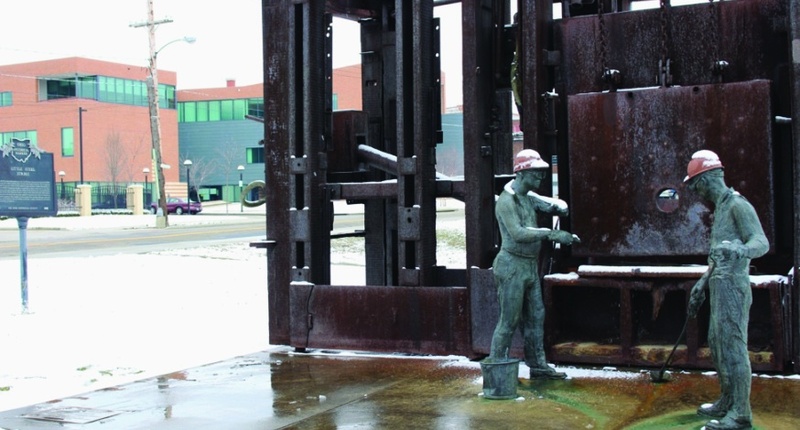 The city of Youngstown was able to store away the sculpture and had it restored. It was then moved in front of The Museum of Labor and Industry on Wood Street, where it peacefully sits today. Zona wrote to Segal’s wife Helen years after George’s death, asking if she still had the plasters. She donated the plasters to the Butler Institute of American Art. “Working on this project was one of the highlights of my life,” Zona said.